Quezon City – Growing up as a child in the second largest and southernmost major island in the Philippines, I was never accustomed to eating sinigang. In Mindanao, I ate adobo, humba, or kinilaw, most of the time diligently prepared by my mother. On special occasions, such as birthdays or weddings, lechon is always a hit amongst many guests, along with pancit or beef caldereta. When I moved to Manila, my everyday menu changed, and I was introduced to a whole new array of scrumptious dishes. It was during a family dinner in a local Filipino restaurant that I got to taste sinigang for the first time, specifically sinigang na baboy or pork sinigang, which was served with rice. We were all in awe at its unique sour taste. Sinigang is a Filipino soup dish characterized by its sour flavor induced by boiled tamarind fruit, which is common in tropical regions such as the Philippines. It consists of meat simmered until soft, as well as vegetables like kangkong (water spinach), gabi (taro), pechay (chinese cabbage), labanos (radish), talong (eggplant), and okra. Back in the day, sinigang was prepared laboriously. Tamarind fruits, which produced the sourness of the broth, were boiled with water for a long time until the shell is removed. The same boiling process is done to the meat to soften it. Other alternative extracts used aside from tamarinds are calamansi, kamias, guava, or raw mango. Today, sinigang is much easier to prepare since tamarind powder flavoring or tamarind bouillon cubes are easily available in the market. To add some spice, siling mahaba or green long peppers are usually added. 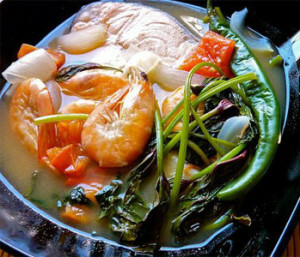 Different types of sinigang dishes are popular throughout the country, depending on the region. The pork can be substituted by chicken, fish, shrimp, or beef, though the sour soup base remains the same. Moreover, because of its popularity, restaurants have managed to modify and add some twists to the regular sinigang by adding peculiar ingredients. Some of the unique innovations of sinigang dishes include sinigang sa ube, strawberry sinigang, sinigang na corned beef, and sinigang na baboy with guava and pineapple. Sour food has always been dominant in Philippine cuisine. Filipinos are very fond of that irresistible tangy taste. In fact, a slice of green mango with bagoong alamang (fermented shrimp) is a daily afternoon snack for many of the locals. Sinigang is considered a Filipino classic comfort food, as it keeps one warm on cold rainy days and is an effective remedy for sore throat. A steaming bowl of sinigang helps warm the body and whet the appetite. Undoubtedly, this beloved dish has come a long way and evolved through time. Even though different ingredients have been used or added to it, sinigang remains an all-time favorite of Filipinos. It is a permanent fixture in the lists of must-try food for foreign travelers, with some who have affirmed sinigang soup as the perfect cure for hangovers after a night of heavy drinking for its sour taste. Since moving to Manila, I have come to love sinigang, which has become part of our family’s weekly menu.